Riding the bus on his own. It is very strange to be sitting here at 3:30. For 14 ½ years, 3:30 has been time to drop what I was doing and meet the school bus. Since my son was in preschool, he has taken a school-sanctioned bus twice a day and my day has been regulated by that bus. The arrival of the bus in the morning determines the time my alarm rings and his drop off time signals the end of “my” day and the start of full-time childcare. As every parent knows, part of childcare is chauffeuring kids to their various activities. For Deane, there’s tutoring, swimming, drumming and physio. So the 3:30 arrival of the bus is like a starter’s gun. It galvanizes me into activity – making dinner, charging necessary equipment, doing stretches or driving off to appointments. Why then am I sitting at my computer at 3:30 and not jumping into action? Still pumped about Deane’s success at camp, I decided to push his independence one step further. 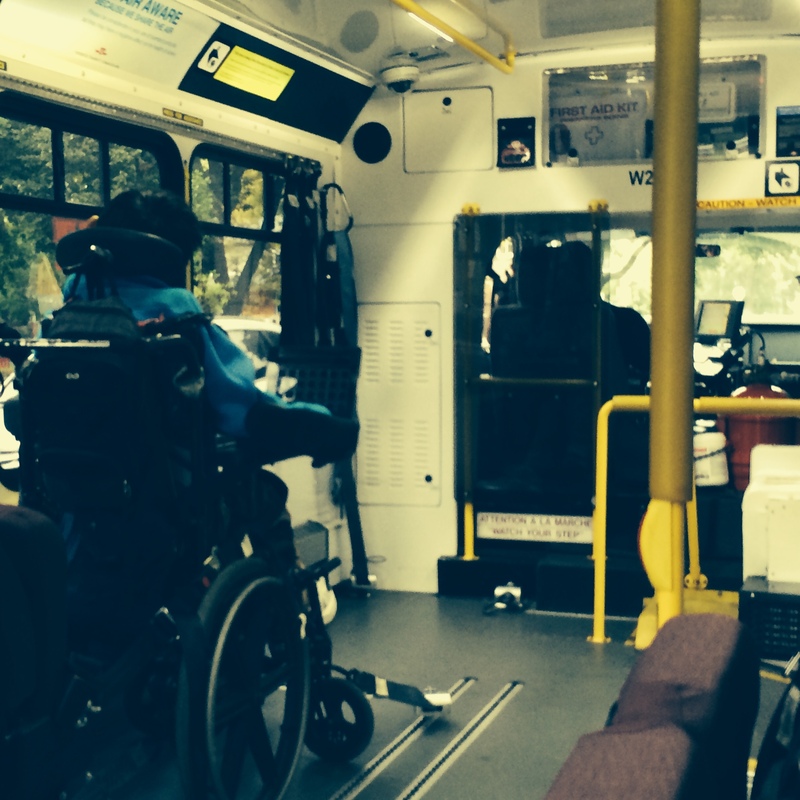 Our city’s transit system runs specially adapted accessible buses. Slightly larger than the small school buses, they do not travel on a predetermined route but can be ordered to go to your destination similar to a taxi. I knew other students from Deane’s school had used this system to go places after school so I thought I’d try it. Deane’s weekly physio appointment is right after school. Instead of him coming home and immediately getting in our van so I could drive him the 15 minutes to his appointment, I thought he could go straight there from school. The end destination is entered into the system’s computer when the order is placed so Deane didn’t need to provide any information. The drivers’ mandate is to take the passenger from door to door. It all sounded great, but letting my non-verbal handicapped child go alone on a bus set off my trust alarms. I wouldn’t let my able-bodied daughter on a bus alone. So for the first three weeks, I rode the transit bus with Deane. Given the seat configuration, I was sitting three rows behind Deane and may as well not been there. Which brings me to being strangely under-occupied at 3:30. Deane is taking the bus on his own. I won’t wander far from the phone in case either end calls to say there’s a problem. In an hour, when I go to pick him up from physio, he won’t look any different, but we both know that we have taken another small step toward separation and independence. A big step for you both. Trust it went well.